Leeks are a dense and tasty vegetable that are well suited to European climates, and have been used in Britain probably since Roman times. (Google "history of leeks". Go on. Aren't you even curious?) I feel they're a very underused vegetable. 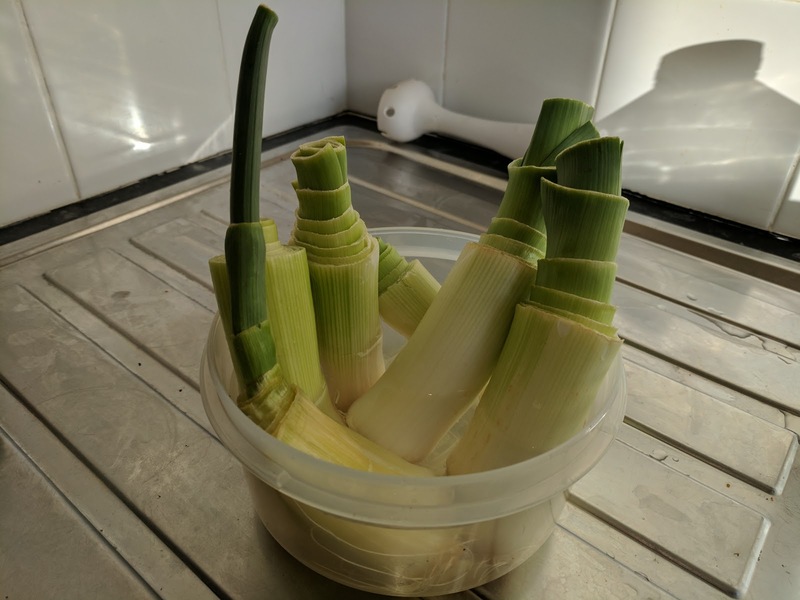 Leek and potato soup? That's about it. In fact they're something you can add to any soup, stew, casserole or other concoction, with or without potatoes. I've even tried them grilled a few times, sliced vertically and with a bit of olive oil and salt, and never regretted it. 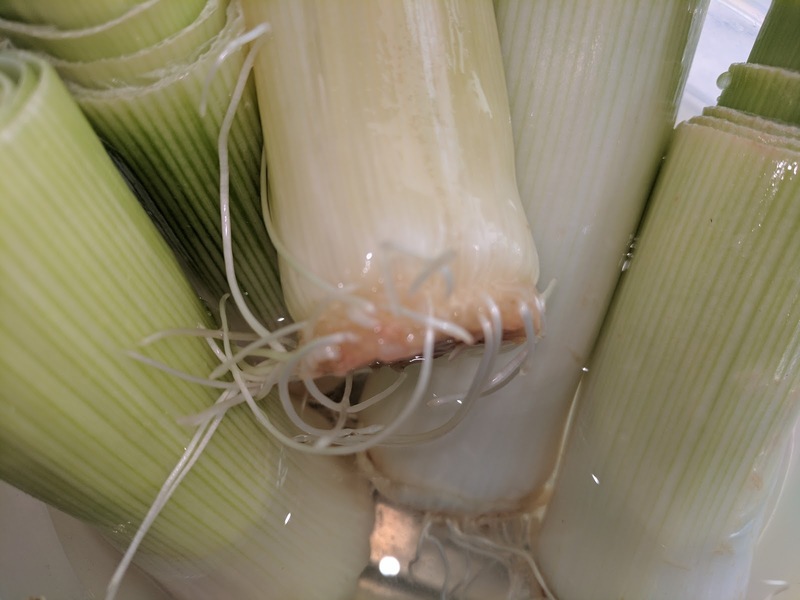 Leeks come from the onion family (along with garlic, chives and - believe it or not - onions) which means they grow roots enthusiastically, even recklessly, wherever they can. And what this all means for the frugally inclined is that they're a perfect candidate for re-growing. 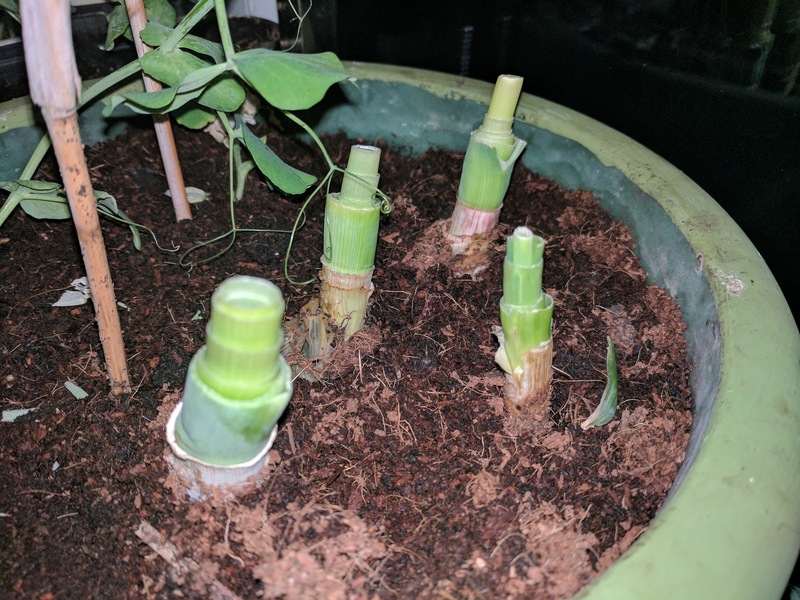 In my experiments so far, they're the vegetable I've had the most success with turning back into edible indoor plants from the ends that would otherwise normally go to waste. Here's how to do it. 1. Slice off the root end at the point where it turns from green to white (about 3-4 inches from the bottom). 2. Leave in a jar or bowl of water, half submerged in a spot that's getting some direct sunlight. I've had best results just leaving them on a kitchen worktop, rather than on a windowsill, where they tend to go a bit too soggy. 3. Change the water a couple of times a week. Some websites recommend changing the water daily, but I haven't found this necessary. 4. 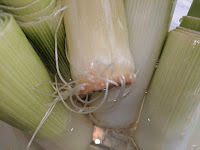 The leeks will start to 'sprout' from the middle, growing back to their original green colour almost immediately. You might be surprised by how fast they grow, even in the winter. 5. After about 2 or 3 weeks, you will start to notice roots growing back. When you have a healthy-looking amount of root growth, plant the leek ends back into soil. I've packed them fairly close together in containers and they're thriving. Very little space seems to be required between leeks, another reason why they're ideal for indoor or container gardening. 6. Cover to the point when you first sliced the vegetable, so that only new growth is above the surface. 7. Whenever you want, slice off new growth, leaving the end rooted in the soil, and allow to re-grow. 8. Report back to me with your findings. The planted leeks pictured above have already started to grow back after I used them in my green stir fry breakfast just the other day. I see no reason why they can't just keep on regrowing indefinitely. Except possibly entropy, or something.